Everybody likes a little variety in their life, be it Linux distros, themes, icon packs, or wallpapers. Well today I'm going to be telling you about a program that can bring you some variety to your desktop wallpaper. For those of you that are regular readers of my blog you'll probably remember my posting about a program called Cortina which is a very simple way to automatically change your wallpaper, but maybe you want something with a few more options, and more features, then look no further than Variety. Variety is a feature rich program that focuses solely on bringing style and pizazz to your desktop. Most distros ship with some default background images, and maybe you have a few of your own images you'd like to be in the mix, further maybe those images are scattered across a half dozen folders, oh and you want to grab some images off the web as well. No Problem. 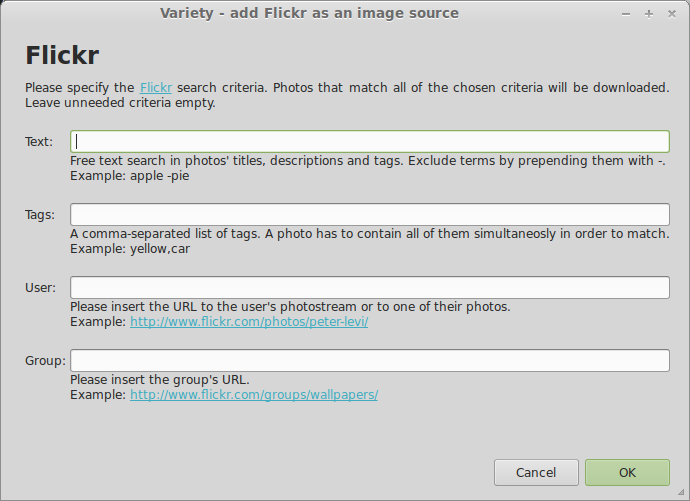 Variety makes it so simple to pull images from multiple locations. The only way it could be easier is if it read your mind. or you can manually add the PPA to your system in synaptic and install that way. Once you've installed Variety on your system it's time to start bringing some variety to your desktop. Launch Variety, if your menu bar auto-hides you won't notice anything right off, but look by your notification icons, you should see a new icon, with a little mountain type painting icon. Right clicking will pull up an options menu, click on preferences and a nice GUI (Graphical User Interface) will load. After you set up Variety to your liking you won't be opening the preferences much, as many of options you usually use are right in the right-click menu. The general tab is divided into three parts, as designated by the bold text. You have the General, Images, and Favorites. The General options are pretty self-explanatory, I will mention that the drop-down box for how often the wallpaper changes gives you the options, Seconds, Minutes, Hours, or Days. You really do have total control over how often your background changes. Please keep in mind that every time your wallpaper changes you'll be using some processing power, especially if the image is being manipulated, so you probably don't want to have the background changing every second. Naturally you're going to want to click on Folders, which will open a standard file browser which you just use to browse to the folder that has your images. Wait you say, I only want some of the images in the folder, worry not click on the Images option instead and then you can make a selection of whatever images you want from one folder, have images in two folders, just do this twice. I will point out that it will add each image as it's own line in the box with the images, so depending on how picky you are, and if you have OCD you might want to make a copy of those images and put them all into a separate folder, absolutely no reason you have to, but I know I personally would, 'cause I like everything to look neat and polished. Just fill in the pertinent data fields and hit OK. Be careful though, to broad a term can result in thousands of results, but not necessarily what you actually wanted. For example I had used Flickr and used Lego as a search term, to be sure all the images had Lego in them, but many were not fit for background images, blurry, and totally random. I should have added in another tag, probably MOC(My Own Creation) to narrow my results and just get better looking images. The images on Wallbase.cc are intended for desktop backgrounds, so they are going to be of higher quality and more worthy of being displayed on your monitor(s). You'll notice very different options here, compared to Flickr the biggest differences being you can select a color, manga or not, and Safe-for-work or NSFW(Not-safe-for-work). Just make your selections and hit okay. We have the even fewer options here than on others, but that's because we need to get a URL to paste in the box. A few are listed and can be used, but swing on by the website to see the full list of categories and select something you like. 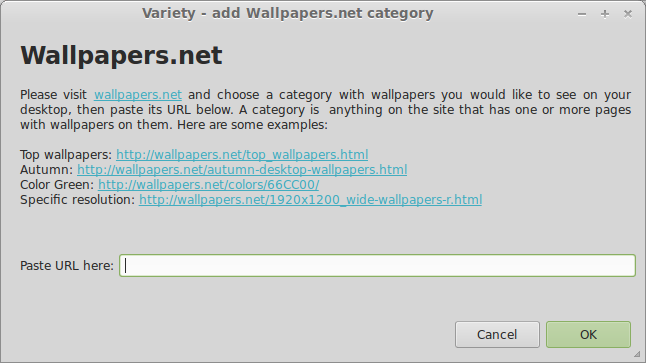 I should, and will mention that currently neither Wallbase.cc nor Wallpapers.net is functioning properly. Now I've never used this option, but it looks like you just need a Media RSS feed and you paste the URL in the box and Variety does it's stuff. I'd bet you can just do a Google search for Media RSS and probably get a bunch. Whew, that took a while, and we're not even finished with the General tab, there is still a bit more important info to cover. Directly under the box that lists all your sources there is an option for how often you want wallpapers downloaded, and where you want the images saved. Depending on how often you change your wallpaper and your network connection you'll probably want to change this. If you are only using images from online I'd probably set the download interval something close to the time between the image change. If you have tons and tons of hard-drive space and don't mind accumulating GB and GBs of data you have nothing to worry about, but if you have a limit on your HDD space, and don't want to be using half your storage for background images there is a very sweet little option to limit the space used by your downloaded backgrounds. 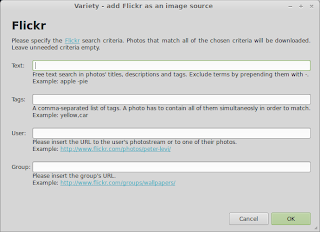 The one last section is called Favorites, and just asks for a location you want to copy favorite images too, this is probably fine as default, but what is it used for? well say your background changes and you just LOVE the image that it changed to, well you can right-click on the Variety icon and select Copy to Favorites, or hover your mouse over it and tap F on the keyboard to do the same. This will make a copy of that image in the Favorites folder, and will keep them from being deleted in the future should your download folder go over the limit you set. As a handy little extra this also means you can copy your favorite images over to another computer to use as wallpaper on them, OR using RSync, or something similar link all the favorite folders on all the computers on a network, really limitless, more importantly though in the Variety interface your Favorites folder is automatically one of your source options, so you can make that your only selection and see just your favorite images. Hows that for thinking about the end user? Well this has gotten quite long, so I'm going to do the complete review/tutorial in multiple parts. Expect next part to be out next Friday.